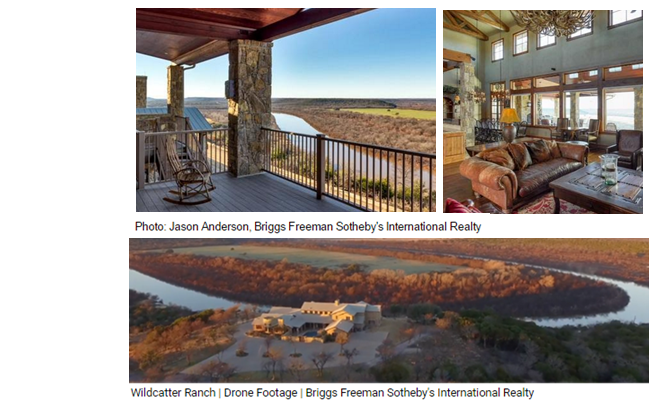 ​​​​​​YOUNG COUNTY – The 1,484-acre Wildcatter Ranch & Resort has hit the market. The ranch and resort is 90 miles from Dallas-Fort Worth near the town of Graham. Located on the Brazos River, the historic western-style property is its own little town, with 16 cabin suites, a 16-room hotel, a 15,436-sf main house, two two-bedroom homes, two horse barns, a 25,000-sf restaurant and an enclosed pavilion. Wildcatter Ranch also has had film roles in movies including Lonesome Dove and The Sons of Katie Elder. The ranch offers horseback riding, an archery range, a sporting clay shooting range, world-class fishing, a pool, a hot tub, a therapeutic spa and 25 miles of hiking and riding trails.